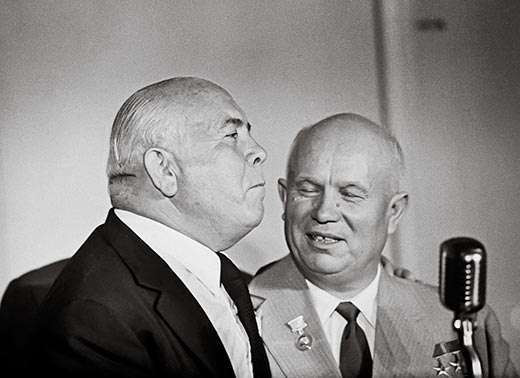 Amid the descent of the Iron Curtain, the Bay of Pigs Invasion, and the conflict in Vietnam lies one of the more bizarre moments of the Cold War – Soviet Premier Nikita Khrushchev’s goodwill tour of the United States that began on September 15, 1959. 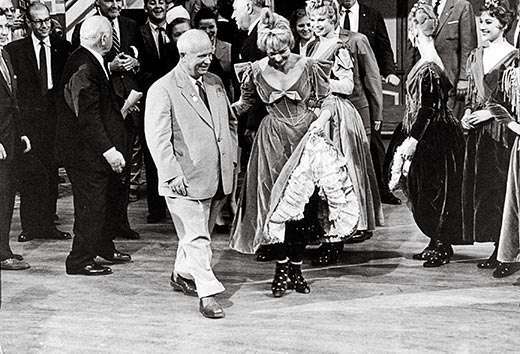 While some may have heard of Khrushchev’s failed attempt to visit Disneyland, many do not realize that this was just one of a hundred things that went wrong on this trip, one that stands in stark contrast to the highly scripted photo ops of today’s politicians. From angry journalists to scandalous movie stars, the entirety of the visit was cloaked by barely concealed threats and marked by chaos – almost to the point of political farce. Richard Townsend Davies discusses how he worked on managing the press during Khrushchev’s less-than successful trip to Los Angeles. He was interviewed by Peter Jessup in 1979. 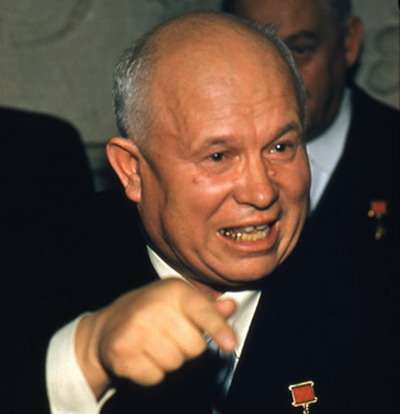 Read about Khrushchev’s hilarious trip to Iowa and the Corn Battle of Garst Farm in Act II. 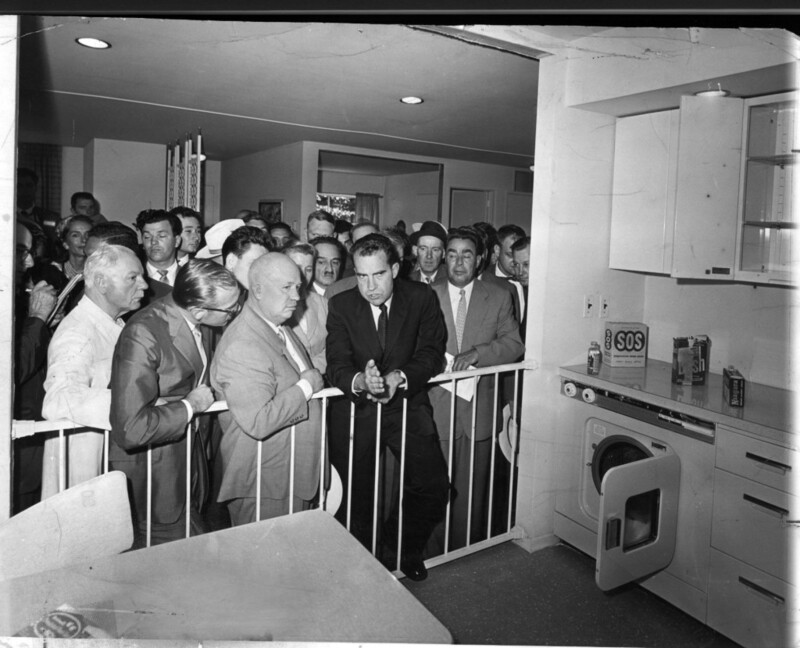 Go here for Khrushchev’s “kitchen debate” with VP Richard Nixon. Read about other foreign dignitaries who actually made it to Disneyland. DAVIES: Mr. Khrushchev made his visit to the United States and I was asked to work with the group of people who were handling the press. 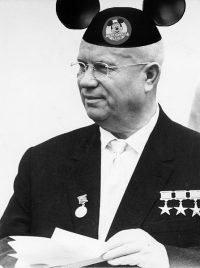 There was an enormous press party which accompanied Mr. Khrushchev around the country, and of course he was met at every stop by sort of double the number of correspondents and journalists who were traveling with him. There was a good deal of discussion on who should handle the logistics for the press party. The White House had a formal organization which was much better equipped to handle that kind of thing, but Jim Hagerty, recognizing — I think quite correctly — truly all the problems that would be involved, the controversy, the difficulties involved in handling such a huge press party, turned it over to Linc White, and Linc White… was not strong on the organizational side, and there was no reason why he should be: his job was to be spokesman for the State Department. So he in turn turned this responsibility over to Joe Reap, who again had never handled anything like this. It was a case of people trying to run away from this hot potato. The big problem of course was that Mr. Khrushchev and Henry Cabot Lodge, who was his guide on his travels after the Camp David talks were over, spent nearly a week traveling around the country. He went, as you remember, to Iowa to the Roswell Garst farm, he went out to the West Coast, he was entertained by Spyros Skouras, in Hollywood, he was taken and shown the filming of the scene from Can Can in which Shirley MacLaine was kicking up her heels, about which he said, “no, this was obscene, the American pornographers”…I thought he quite enjoyed it. I was watching him, and he seemed to be enjoying it, but he had great sport with that. Q: The best people in the journalistic world. DAVIES: The very best people. Everybody wanted to be involved in this trip, and even those journalists who didn’t stick with the trip throughout wanted to be there for the major stops, because at each stop there was something very newsworthy: as I say, in Hollywood going to the stage — the sound stage — where Can Can was being filmed, in San Francisco there was a meeting with [head of the United Auto Workers, UAW] Walter Reuther, with labor leaders, and I think Harry Bridges [head of the International Longshore and Warehouse Union, ILWU] was there. And this was an extremely important milestone in the history of Soviet-American relations, as I hardly need to stress, and the important events had occurred already at Camp David, and would terminate, as I recall, with Khrushchev’s first appearance at the U.N., so in Washington and in New York, nevertheless this trip was an enormous media event, one of the great and one of the early great media events which were covered by television and all that. We had all kinds of stars with us. And all these correspondents felt as I say that they had to be in the immediate vicinity of the principals…and they couldn’t be, because you couldn’t get 200 or 300 people into that space and have anything but a mob scene, so there had to be a press pool, and that meant that somebody had to decide every day who the members of that pool were going to be. 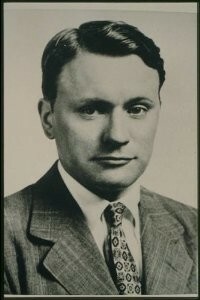 There were roughly 15 people selected to be members of the pool, and the functions of these people were to observe, to be in the immediate vicinity of Khrushchev and the leading Americans who were with him, and whom he met at each stop, and then to go back and be debriefed or debrief to the remainder of the press corps who couldn’t squeeze in to be near Khrushchev and his American hosts when there was an event of some sort. For example, at the luncheon which Spyros Skouras (the President of 20th Century Fox, in photo at left) gave in Hollywood, where many glittering Hollywood stars were guests, you couldn’t have 300 newspaper people in the room, so these 15 who were in the room were picked to be representatives of the various branches of the media. But since there were — I forget exactly how many events there were, but let’s say that during the six days there might have been as many as 20 events — not everybody could be a member of the pool, and that included people who were spending a great deal of money, whom the State Department was charging a lot of money to pay for the hire of the airplane in which they flew around from place to place, and for the provision of the accommodations which the State Department was responsible for reserving at each stop. Joe Reap kind of threw his hands up and said, look, it’s going to be a disaster no matter what happens. And Linc White said the same thing, he said it’s going to be a disaster. And I said, “It won’t be a disaster, we’ll all pull together, we are all in this thing together,” which we were – all in it together. But the first trouble began on the trip up to Hyde Park, where he was supposed to go and lay a wreath at the grave of President Roosevelt. President Roosevelt of course was honored, so to speak, in the Soviet Union, he was a great friend of Russia, and if he had only lived, if he had not died everything would have been honky-dory, and so forth. So he went up there, and Eleanor Roosevelt was there and received him at Hyde Park, and the trouble began right there. The trip had only just begun. This was the first day of the trip, and the question arose as to who was going to be in the pool, because there was a motorcade organized by the New York State Police – the security was extreme of course – and there was a press car, or maybe two, in which the pool would ride. Well, I had nothing to do with the pool; that was up to Joe Reap. But there just wasn’t room for everybody. People were fighting to get into these station wagons, and it was kind of what the kids call these days a heavy scene. It was not well organized. And you know, here were Scotty Reston and all the rest, all these great journalists not only seeing this occur but being victims of it, participating in it, so you knew that sooner or later there was going to be a blast from the press about the whole thing. All right. From Hyde Park — from New York rather…. Then sort of the first thing that happened was — and this developed on the way from the airport to the hotel where Khrushchev was staying — that Khrushchev said he wanted to go to Disneyland. [He vetoed] going to Disneyland, because it would require closing Disneyland a day ahead of time, and then sending hundreds and hundreds of people in there to search it and make sure that somebody was not hidden at the top of a Ferris wheel or someplace with a high powered rifle waiting to shoot Mr. Khrushchev when he came in. So General Serov himself had vetoed it, he had agreed that this would be impossible. But Khrushchev made great publicity about this, and he was attempting, in what I regard as typical Soviet fashion, to put the Americans on the defensive, and Henry Cabot Lodge – whom I had met and gotten to know a little bit during the few days when he visited Afghanistan and was a very nice man — in this kind of head-to-head confrontation with this very shrewd peasant, this very rough infighter, it took [Lodge] a while to figure out that he was being attacked, but he was, you know. Initially, he thought, well, he really wants to go to Disneyland. And maybe for all I know he did. However, my perception of it was that this had been worked out rather carefully, and it was a ploy. “Let’s say that you want to go to Disneyland. They of course will say, “No, it’s impossible,” and then you have already established your position as a demandeur, whose reasonable request, so far as the American people — the American people will say, why sure, of course, everybody wants to go to Disneyland…It’s a free country.” So that was the first thing that happened. DAVIES: The Chairman, or whatever it was, of 20th Century Fox. There were several other speeches in like vein, but Spyros Skouras’s was perhaps the most aggressive. It was well meant, but of course there had been no advance planning, and nobody had said to Spyros Skouras we want to handle it this way or that way. But I don’t think it would have made any difference if they had said that, so unorganized or disorganized we were. It was after that lunch that we went to the Can Can sound stage with Shirley MacLaine, and so far as I could see everything there was great jollity. I think Mrs. Khrushcheva was not exactly enchanted. She was, as far as I was aware…a woman of considerable education, and I would say even culture, not prepossessing looking by our standards, but an intelligent woman, who had contributed enormously, I believe, to Khrushchev’s education. She was a school teacher when they were married, he was unschooled, very crude, raw, a peasant boy who had gone to work in a mining town in the Ukraine and never had any higher education, but she came from a slightly better background and helped to educate him. Nina Petrovna – I think she was quite a remarkable woman. Well, I don’t think she was exactly enchanted. There was something very condescending in a way, I think, or at any rate they didn’t understand – she didn’t understand, she was not quite aware of what this was, and here were these very scantily dressed, charming young ladies prancing about in a fashion which in the Soviet Union with its prim and proper ways would have been regarded as pretty daring, if not actually obscene almost. 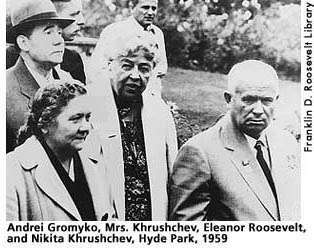 So she was not quite pleased by the whole thing – it was evident – but Nikita Sergeyevich Khrushchev appeared to enjoy it. Well, then that evening there was a big dinner at the hotel. The Mayor was there again and made what I think Khrushchev, I would say more or less accurately, described as ugly noises. He was trying to make politics out of the whole thing and to score a point or two off Khrushchev, the way Nixon had scored a point, and a very substantial one, during the visit to the Soviet Union, by shaking his finger under Khrushchev’s nose as he engaged with him in a polemic. 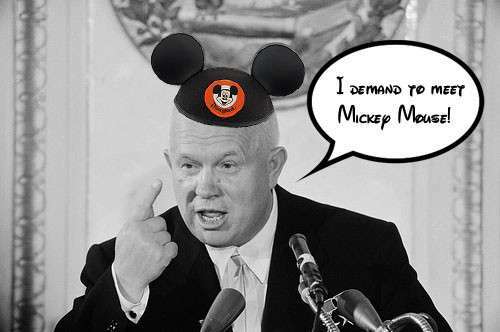 So Khrushchev then chose this occasion to drive home — to cap the psychological effort that he had begun earlier with the ploy about Disneyland, and it was then that he threatened to go home, and he enumerated all these things. First of all, the Mayor in greeting him had been rude, which was not a bad description. But he said to the Mayor, “If this is what you call your capitalist manners, your good manners and hospitality, I want to tell you that we Russians have a different conception of hospitality. And he took the pose of one who had been offended, and he was indignant, and righteously so, and he said it was very simple, that he had been invited here by the President, but if in fact it were the case that he was not welcome, then he was quite capable…, the plane was standing by, he would have it called there, and he would get on the plane and go right back to the Soviet Union. Well, needless to say this sent a tremor — a tremor! — through the assembled dignitaries. What does this mean? It’s very threatening. I don’t know that the President telephoned Khrushchev directly because they had no common language, but through Henry Cabot Lodge the President conveyed his apologies. In other words, Khrushchev had succeeded in putting us in a corner quite adroitly, very well, utilizing our own mistakes. It was a comedy of errors, which however had more serious overtones….